I've been very fake busy lately, with the holidays and all sneaking up on me out of nowhere. I've not been crafting a lot. I've done some stuff, which I'll be posting about later, after I've taken pictures, but nothing horribly exciting. My knitting has been sort of tossed to the wayside. Poor Helen's poor socks. I should have known it would happen. I've... run out of yarn. An inch before the toe. The bad part? I'll have nine/tenths of a skein left after I finish these socks. The good part? This calls for a purchase at ♥the Loopy Ewe♥. I'll be honest and say I was so tempted to buy more lovely sock yarn, but I limited myself to the skein I needed and a gift certificate for someone else. I'll get the sock yarn I want next time when I've worked through the yarn I've currently got stashed. Plus, this way, I can become a loopy groupie faster. I've been really slow with this second sock. As most sock knitters know, once you know you're going to run out of yarn, you do one of two things. You either knit so quickly that it hurts, hoping that the pure speed of your knitting will prevent you from running out of yarn. Alternatively, you stall. You never knit on the project because you know what's coming. What have I been doing then, you ask? Caring for a baby and reading blogs mostly. The baby has the sniffles and the blogs have a lot of posts. I've also been up and about, which is better, visiting people, lunching, whatnot. I've done a bit of sewing. Here's some cute little 0-3 month booties for my eldest cousin's soon-to-be-arriving baby. 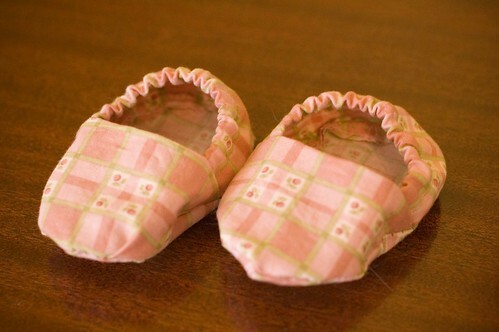 As the little girl will be arriving in April, I thought that some nice cool cotton booties might look sharp. My mom has asked for several more sewn items for the baby such as bibs and/or burp cloths. Anyway, that's it for today. This is just meant to be a quick update. I'll update my next post with more pics of what I've been doing, hopefully, and include some of my future crafting plans!